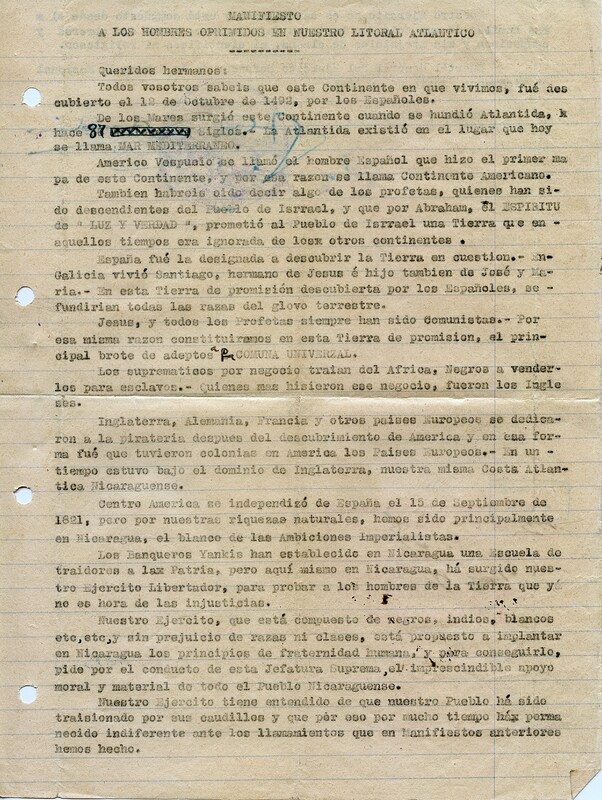 THIS IS THE EIGHTH PAGE of documents for the FIRST HALF of 1931 on Nicaragua's Caribbean Coast region, housing materials dated in the month of June. The aftereffects of the April offensive continue rippling throughout the northern parts of the Coast, with the same types of documents expressing themes similar to those highlighted on previous pages. 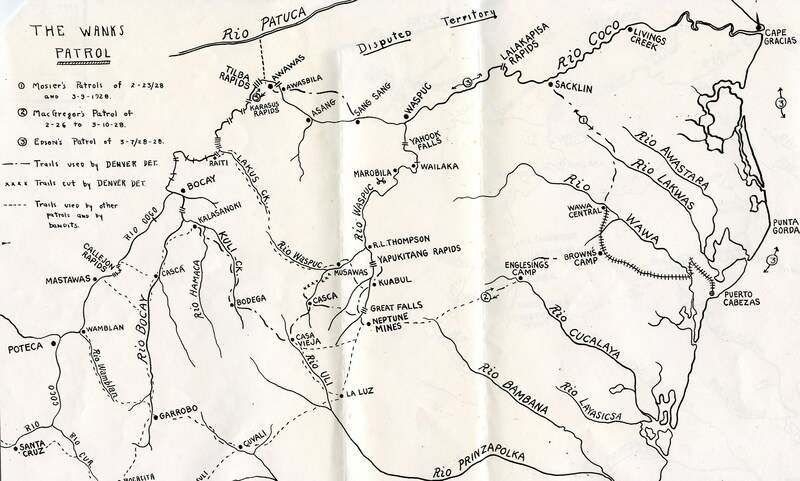 The Moravian missionaries unanimously decide to stop charging Miskitu converts for communion & that “all Church Contributions be used only to support Indian work” — and, that “in view of the influx of the Spanish element from the Interior … and the anti-foreign attitude propagated by Sandino and his followers,” that they should build a special training school in Pearl Lagoon for teaching the natives in Spanish (1 & 2 June). 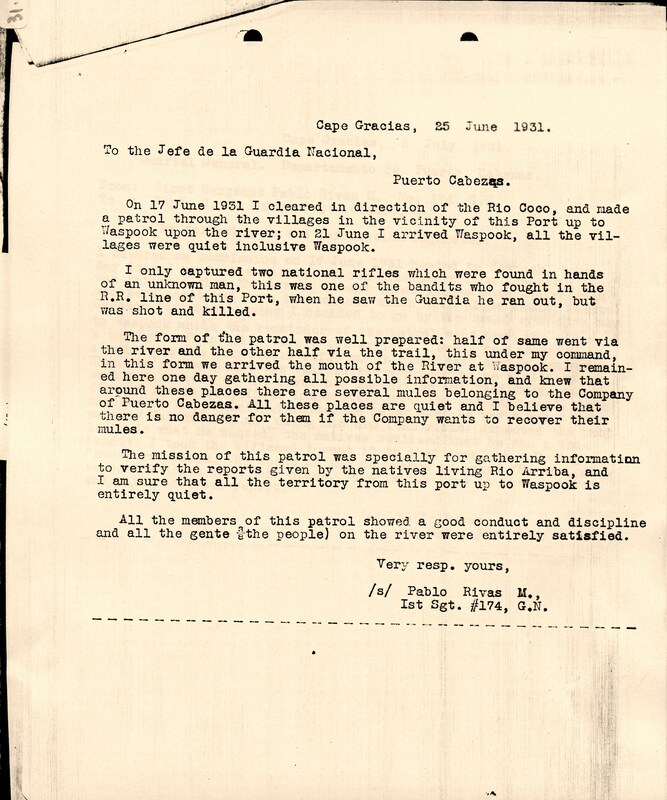 We see Sandino, in three never-before published missives, informing Manuel Flores, Florencio Silva & Sebastian Montenegro Pineda in Las Segovias that two of his leading officers, Gen. Carlos Salgado & Col. Abraham Rivera, are poised on the outskirts of Cabo Gracias a Dios & Puerto Cabezas (8 June); his military commission to Lt. Col. Perfecto Chavarria & Capt. Francisco Ellis for another expedition to the Coast (18 June); and, most significantly, his bizarrely formulated “Manifesto to the Oppressed Men of the Atlantic Littoral” (21 June). We see Col. Wynn in Bluefields announcing that the national government has declared the entire “LITORAL ATLANTICO in an official state of siege,” along with the expansion of Guardia power through the creation of new posts at Moss Farm, Kipla Farm & along the railroad line. “There is no evidence of actual presence of bandit elements in this area,” writes Wynn, though he does note “a few rumors in the Northern Department of probable bandit activity in that section” — a likely reference to the Salgado-Rivera column (8 June). Guardia Jefe Director Gen. Matthews and Cabo Gracias businessmen Albert Fagot & Manuel C. y Bordas continue ironing out the details for Guardia protection of the Río Coco (20 & 22 June), while 1st Sgt. Rivas’s patrol report describes his patrol’s excursion to Waspook & its environs, which he describes as “entirely quiet” (25 June). It will not remain "quiet" for long. Minutes of Informal Consultation among the Moravian Bretheren, Bluefields, signed by D. Haglund, H. H. Stortz, G. H. Heath. "The brethren Danneberger, Haglund, Heath, Stortz, Wilson, Wolff and the Sisters Danneberger, Haglund, Heath met on Monday morning June 1st for an informal consultation about the present acute emergency in our Mission Province. Bro. Shimer was invited, but was prevented from being present; and Br. Palmer was out of town. ¶ It was felt strongly that our Indian congregations have never understood and do not now understand our financial arrangements, particularly our system of so-called Church Dues; and that the Mission has been seriously slandered on that account. The brethren Haglund, Stortz and Heath were appointed as a committee to look into this matter and make suggestions to P.B. and S.P.G. ¶ The Committee’s findings were as follows: ¶ 1. We recommend, through P.B., that in our Indian congregations NO collection of any sort should be made in connection with the Communion; and that the wine be paid for out of the Local congregation Account. When a Poor Fund is needed we suggest that the offerings at the Public services on Communion Sunday could be for the poor. ¶ 2. We earnestly urge that arrears of Church Contributions (“Mani Ialaka”—be NOT counted as debts from year to year; further, that no member be kept back from Communion for non-payment. Persistent delinquents might be disciplined by depriving them of the right to attend or vote at Congregation Council Meetings. ¶ 3. However, we are convinced that the whole system of Church Contributions needs radical alteration. We recommend that early in the New Year a Congregation Council be called, at which each member is asked to make a voluntary assessment for the year. It would be especially important that the minister, evangelist, or other official worker should assess himself along with the rest. The amount promised might be collected in quarterly installments, payable preferably at Quarterly Congregation Council meetings. ¶ 4. We most earnestly urge that all Church Contributions be used only to support Indian work; and that our Provincial Accounts and Local Station Accounts be made to show this. And to this end we suggest that this money, AS WELL AS THE SUNDAY COLLECTIONS, be entirely at the disposal of the local congregation acting through its church committee; and that out of the Local Church Funds gathered by collections, voluntary annual assessment or any other means, the congregation make a substantial grant each year towards an Indian Worker Fund, out of which our Indian evangelist (catechists), teachers, and eventually ministers, should be paid. ¶ 5. We realize that if our suggestion is accepted, we would not able for the first year or two to make any estimate as to the probable result. ¶ 6. If our suggestion be accepted, changes would have to be made in our book of Order, Brotherly Agreement, and Annual Account Blanks. ¶ 7. We strongly urge that under no circumstances whatever fees should be requested or charged for ecclesiastical rites, as Baptism, Marriage and Burial: but voluntary offerings may always be accepted and should be included in the Local Church Funds mentioned above. (It should be observed that actually in our Indian congregations such fees as are referred to have rarely been charged.) ¶ NOTE. The above recommendations apply to the Indian congregations from Quamwatla northward; and also the Karawala pastoral charge if this should not be included in the Southern District. ¶ Signed: ¶ D. Haglund ¶ H. H. Stortz ¶ G. R. Heath"
Letter from A. O. Danneberger, Fr. Wolff & Hedley E. Wilson, Bluefields, to the Directors of the Society for the Propagation of the Gospel, Bethlehem, PA. "Dear Brethren:--¶ We missionaries having been forced by existing conditions to be in Bluefields, met together for a general discussion of some of the vital problems that confront the Province. The present action of the brethren was taken in view of the rapid changes that are taking place which aggravate these problems. ¶ The brethren present asked the Bretheren Danneberger, Wolff and H. Wilson as a committee to inquire into the present state of our educational work in the Province, and to send in their findings to be P.B. and S.P.G. 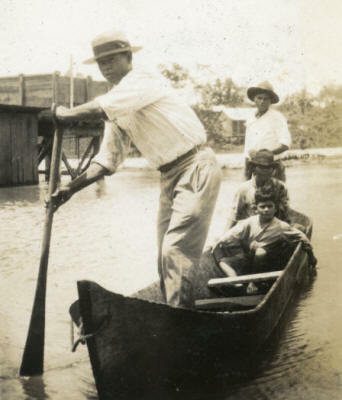 ¶ In view of the influx of the Spanish element from the Interior that is felt everywhere, and will be more so upon the completion of the Rama Highway and the Pearl Lagoon Canal, and the anti-foreign attitude propagated by Sandino and his followers, more and more thoroughly trained natives are demanded. ¶ Therefore, we find it necessary to concentrate our educational efforts upon the thorough education of natives in Spanish, and this can only be done by creating a Spanish atmosphere in a specially equipped training school. ¶ It was the unanimous opinion of the brethren that such a school should be located in Pearl Lagoon in view of its recent industrial developments – rice mill, sawmill and agriculture. ¶ Discussing the building plans and the employment of Spanish teachers, we have come to the conclusion that the amounts hitherto granted for the various educational purpose in the Province, viz., grant for training evangelists, educating a few Indian boys in Bluefields, and the grant of $2000 used for the Junior High School would be sufficient for the execution of the plan laid before you, without asking for additional grants. This will be made possible by the development of the rice industry in Pearl Lagoon, which was begun with the intention of opening an educational centre for the Coast. We feel bound to add that in our deliberate opinion the Junior High School is not fulfilling its purpose, particularly with regard to the training of Indian teachers. ¶ We also beg to remind S.P.G. of the repeated petitions of the native brethren in regard to the education of their children. We are of the opinion that this would solve the problem. ¶ The main idea of this petition is nothing new, having been presented at each G.M.C. The present situation demands immediate attention and we believe this is to be our last opportunity to maintain our educational influence and usefulness. A copy of this petition is also sent to P.B. ¶ Yours fraternally, [Signed] ¶ A. O. Danneberger ¶ Fr. Wolff ¶ Hedley E. Wilson"
Memorandum of Meeting Held June 2nd, 1931, in Bluefields, signed by C. Conrad Shrimer & A. O. Danneberger. "An informal conference was held this date between Brother C. Conrad Shimer, Acting Superintendant in the absence of Bishop Grossmann, and Brother Danneberger, who had come to Bluefields to send his children to the United States. ¶ MURDER OF BRO. KARL BREGENZER ¶ Official announcement is made of the murder by Sandinistas at Musawas of Brother Karl Bregenzer, on March 31st. His family, consisting of his wife, two children and mother-in-law, were in the “bush” at the time of the brutal slaying. After a month of great anxiety and uncertainty, Sister Bregenzer and her family arrived safely in Bluefields Saturday morning, May 2nd. ¶ ASSEMBLING OF MISSIONARIES AT BLUEFIELDS ¶ Due to the outbreak of lawlessness and threats made against the missionaries, Brother Shimer dispatched a schooner to Kaurkira, Honduras, to get Brother and Sister Heath, Sister Kreitlow and the Haglund family and to bring them to Bluefields. The Haglunds had fled into Honduras from Cape Gracias when it became known the Sandinistas were approaching Cabo Gracias. Accompanying them from the Cape was Leo Mueller, one of the native evangelist, and his family, as Leo’s life had been threatened. Going into Honduras the Haglunds had taken Miss Kreitlow with them. In the meantime the Stortezes had fled from the Cape to Sandy Bay, and with the Bishops had come to Puerto Cabezas, and from here they were brought to Bluefields. ¶ FURLOS [sic] AND SAILINGS FOR THE UNITED STATES ¶ Brother and Sister Bishop and son sailed for their homeland on May 14th on furlo. The same ship carried Sister Bregenzer and her family. ¶ Because of the interruption of the work it was decided to have Miss Kreitlow take her furlo, ordinarily due next year, in the current year in the hope that conditions would warrant resumption of the work when she returns. The same ship also took to the United States Margaret, Arthur and Edwin Danneberger, all going earlier than contemplated because of existing conditions. ¶ It is pointed out that there have been many unusual extra-budget expenses in these weeks, the travelling of Miss Kreitlow and the Danneberger boys also not having been allowed for in the budget. ¶ PLACING OF EVANGELISTS DURING INTERRUPTION OF WORK ¶ It is known that the evangelists from Bilwi north have stopped work due to the unrest prevailing in the country. Dannery Downs at Bilwaskarma is the only evangelist who has remained at his post. ¶ Unable to continue work at Tuberus for the same reason of unrest, Artemis Wright was removed from that place and sent to work at Wounta and Walpasiksa. It was decided to pay all the . . . ¶ [Signed:] C. Conrad Shimer, A.O. Danneberger"
Letter from Gen. Augusto C. Sandino, Cuartel General del EDSN, to Manuel Flores, Florencio Silva and Sebastian Montenegro Pineda, El Encanto de Las Segovias. (SOURCE: NA127/E38/Box 30) "Cuartel General del EDSNN. 8 de Junio de 1931. Señores ¶ Juez de la Mesta Manuel Flores ¶ Correo Local Florencio Silva y ¶ Jefe de Espionaje en la zona Oeste Sebastian Montenegro Pineda ¶ El Encanto de Las Segovias ¶ Queridos hermanos: ¶ Fué en mi poder sus muy atenta nota, en la que se sirven participarnos de la organizacion hecha por Uds, con los vecinos de ese lugar para el servicio de nuestra santa y gloriosa causa. ¶ Tenemos noticias de que el enemigo trata de hacer un esfuerzo para entrar a estas montañas, pero todo lo tenemos preparado para desacerles cualquier plan que ellos traten de desarrollar. ¶ Nuestra columna No 4, que antes operó bajo las ordenes de nuestro inolvidable hermano General Miguel Angel Ortez, y que hoy opera bajo las ordenes de nuestro hermano General Juan Gregorio Colindres, muy pronto batiran al enemigo por los lados del Jicaro y Jalapa. ¶ Nuestra columna No 3, que opera bajo las ordenes del hermano General Pedro Antonio Irias, está lista para atacar culaquiera de las plazas cercanas a estas montañas, si el enemigo las dejase deviles. Tambien nuestra columna No 5 que opera bajo las ordenes del hermano General José Leon Diaz, atacará la plaza que le sea posible. ¶ Ayer recibimos comunicaciones de nuestras columnas No 2 y No 6 que operan bajo las ordenes de los hermanos General Carlos Salgado y Coronel Abraham Rivera, participandonos de que se encuetran nuevamente en el Cabo de Gracias a Dios y Puerto Cabezas. Dicen tambien que se les há presentado mucha gente y que entraron gran cantidad de gente armada de la revolucionaria de Honduras y que se han ingresado a nuestras columnas expedicionarias. ¶ Nuestra columna No 1 que opera bajo las ordenes de nuestro hermano General de Divicion Pedro Altamirano, há tenido brillantes triunfos en los alrrededores de Matagalpa. ¶ En uno de estos dias llegarán a este Cuartel General, 20 rifles equipados y tres Ametralladoras, para utilizarlos en la vigilanza de la orilla de esta montaña y evitar de que el enemigo entretan tranquilo a robarse el mais de los vecinos. ¶ Les remito las constancias que solictan para los 5 hermanos Detectives que estarán bajo las ordenes inmediatas de los tres de Ustedes. ¶ No son nombramientos, sino que constancias las que se le remiten a los cinco hermanos mencionados. ¶ Cualquiera de nuestros Jefes que lleguen por esa Zona, se entenderan con los 3 Ustedes. ¶ Sinceramente sus hermano, ¶ Patria y Libertad, /s/ A. C. Sandino"
Record of Events, Eastern Area, May 1931. Col. C. A. Wynn, Bluefields, to Jefe Director GN Managua, p. 1. Record of Events, Eastern Area, May 1931. Col. C. A. Wynn, Bluefields, to Jefe Director GN Managua, p. 2. Record of Events, Eastern Area, May 1931. Col. C. A. Wynn, Bluefields, to Jefe Director GN Managua, p. 3. Official Names of new Guardia posts, Department of Northern Bluefields. Col. C. A. Wynn, Bluefields, to Jefe Director GN Managua. "GUARDIA NACIONAL DE NICARAGUA ¶ CUARTEL GENERAL, AREA DEL ESTE Bluefields, Nicaragua. 9 June 1931. ¶ From: The Area Commander, Eastern Area. ¶ To: The Jefe Director, Headquarters Guardia Nacional de Nicaragua, Managua, Nicaragua. ¶ Subject: Official names of new Guardia posts, Department of Northern Bluefields. ¶ 1. It will be noted that in current monthly reports, Record of Events, Area personnel Report, that the following names have been used for the newly established posts, on the Bragman Bluff Lumber Company Railroad line which is owned by the Standard Fruit and Steamship Company:- ¶ “MOSS FARM”, located in the Tigne Farms District. ¶ “KIFLA FARM”, located in the New Vance Tract. ¶ 2. Unless directed to the contrary, the above names, i.e., MOSS FARM, and KIPLA FARM, will be used as the official designation of the new posts. ¶ 3. Reference is made in connection with this correspondence to my radiogram dispatch, number 14323 MAY 21, and also to the map entitled “Map Showing Bragman Bluff Lumber Co., Nicaraguan Properties”, dated Nov. 17, 1928. The latter named reference shows “MOSS”, and “KIFLA”, blocked out in clear lines. (signed) C. A. WYNN"
Letter from Gen. C. B. Matthews, Jefe Director GN, Managua, to Colonel Irwing A. Lindberg, Collector of Customs & High Commissioner, Managua. "This acknowledges receipt of your letter, dated June 8, 1931, enclosing copy of a communication you received from Mr. A. Fagot, Cape Gracias. ¶ The subject matter of Mr. Fagot's letter, particularly the last paragraph, has been under consideration for several weeks and if present plans materialize it may be possible to establish a Guardia post at Waspuc or its vicinity. ¶ At the present time this organization is in correspondence with Mr. Manuel C. y Bordas, Nicaraguan products corporation, Cape Gracias, on the subject of raising an additional force of guardias to be supported by contributions from his Company and other business concerns that are interested. Mr. Bordas made the suggestion and expressed willingness on behalf of himself and others to enter into such an agreement. The Guardia tentatively accepted the general plan and offered to establish a post of 2 officers and 30 men at Waspuc, the cost of 20 men to be borne by merchants and the Guardia to defray the expenses of 10. That is the way the matter stands at present andI will advise you of the action eventually taken by Mr. Bordas on the proposition. ¶ It is suggested that you advise Mr. Fagot to get in touch with Mr. Bordas in Cape Gracias, as it appears that they have interests somewhat in common and that cooperation of the two would be beneficial to all concerned." Credentials from Gen. Augusto C. Sandino, Cuartel General del EDSNN, to Tnte. Cor. Perfecto Chavarría & Capt. Francisco Ellis Respectivamente de Comisión Militar de Nuestro Ejército en el Litoral Atlántico de Nuestra República. 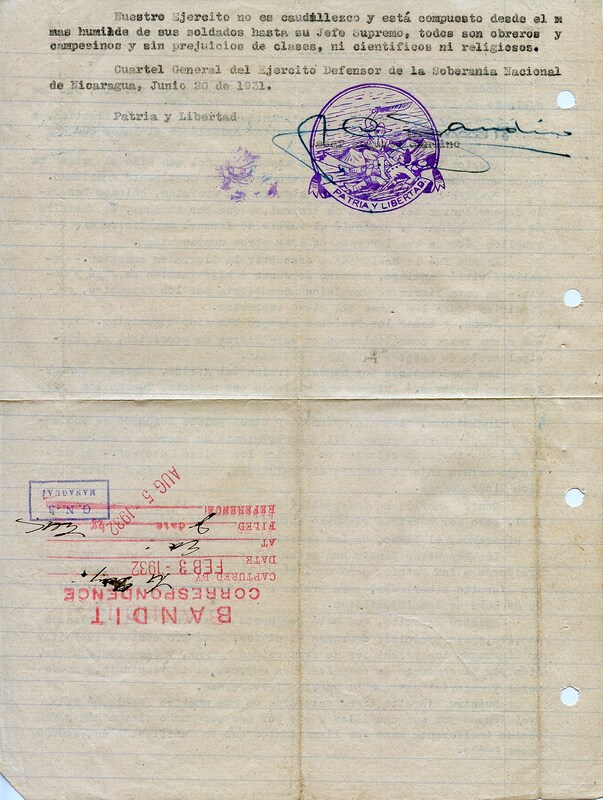 (SOURCE: NA127/E38/Box 30; original document, captured by Lt. Gray, 3 Feb. 1932) "El suscrito General y Jefe Supremo del Ejercito Defensor de la Soberania Nacional de Nicaragua, en uso de las facultades conferidas por el mismo Ejercito, extiende el presente nombramiento a los hermanos Teniente Coronel Perfecto Chavarria y Capitan Francisco Ellis, de Jefes respectivamente de la comision militar que con esta fecha sale de este Cuartel General de nuestro Ejercito a la Costa Atlantica de nuestra Republica. ¶ En esa virtud, quedan autorizados los mencionados Jefes, á solicitar elementos belicos y recursos economicos para el sostenimiento de las fuerzas a su mando, pero sin contraer compromisos politicos con nadie. ¶ Respetense y cumplanse las ordenes que emanen del Coronel Chavarria y el Capitan Ellis, en sus caracter de Jefes de comision militar de nuestro Ejercito. ¶ Dado en el Cuartel General del Ejercito Defensor de la Soberania Nacional de Nicaragua, á los diez y ocho dias del mes de Junio de mil novecientos treinta y uno. ¶ Patria y Libertad /s/ A. C. Sandino"
MANIFIESTO A LOS HOMBRES OPRIMIDOS EN NUESTRO LITORAL ATLANTICO. Gen. Augusto C. Sandino, Cuartel General del EDSNN, p. 1. (High-resolution scans of original document [ca. 8 MB]. SOURCE: NA127/E38/Box 30. Captured by Lt. Gray, 3 Feb. 1932, Biltigne River.) "Queridos hermanos: ¶ Todos vosotros sabeis que ste Continente en que vivimos, fue descubierto el 12 de Octubre de 1492, por los Españoles. ¶ De los Mares surgió este Continente cuando se hundió Atlantica, hace 87 siglos. La Atlantica existió en el lugar que hoy se llama MAR MEDITERRANEO. ¶ Americo Vespucio se llamó el hombre Español que hizo el primer mapa de este Continente, y por esa razon se llama Continente Americano. ¶ Tambien habreis oido decir algo de los profetas, quienes han sido descendientes del Pueblo de Isrrael, y que por Abraham, el ESPIRITU de "LUZ Y VERDAD", prometió al Pueblo de Isrrael una Tierra que en aquellos tiempos era ignorada de los otros continentes. ¶ España fué la designada a descubrir la Tierra en cuestion. En Galicia vivió Santiago, hermano de Jesus é hijo tambien de José y Maria. En esta Tierra de promision descubierta por los Españoles, se fundirian todas las razas del glovo terrestre. ¶ Jesus, y todos los Profetas siempre han sido Comunistas. Por esa misma razon constituiremos en esta Tierra de promision, el principal brote de adeptos LA COMUNA UNIVERSAL. ¶ Los suprematicos por negocio traian del Africa, Negros a venderlos para esclavos. Quienes mas hicieron ese negocio, fueron los Ingleses. ¶ Inglaterra, Alemania, Francia y otros paises Europeos se dedicaron a la pirateria despues del descubrimineto de America y en esa forma fue que tuvieron colonias en America los Paises Europeos. En un tiempo estuvo bajo el dominio de Inglaterra, nuestra misma Costa Atlantica Nicaraguense. ¶ Centro America se independizó de España el 15 de Septiembre de 1821, pero por nuestras riquezas naturales, hemos sido principalmente en Nicaragua, el blanco de las Ambiciones imperialistas. ¶ Los banqueros Yankis han establecido en Nicaragua una Escuela de traidores a la Patria, pero aqui mismo en Nicaragua, ha surgido nuestro Ejercito Libertador, para probar a los hombres de la Tierra que ya no es hora de las injusticias. ¶ Nuestro Ejercito, que esté compuesto de negros, indios, blancos, etc, etc, y sin prejuicio de razas ni clases, está propuesto a implantar en Nicaragua los principios de fraternidad humana, y para conseguirlo, pide por el conducto de esta Jefatura Suprema, el imprescindible apoya moral y material de todo el Pueblo Nicaraguense. ¶ Nuestro Ejercito tiene entendido de que nuestro Pueblo ha sido trasionado por sus caudillos y que por eso por mucho tiempo ha permanecide indiferente ante los llamamientos que en Manifiestos anteriores hemos hecho. ..."
MANIFIESTO A LOS HOMBRES OPRIMIDOS EN NUESTRO LITORAL ATLANTICO. Gen. Augusto C. Sandino, Cuartel General del EDSNN, p. 2. (High-resolution scans of original document [ca. 8 MB]. SOURCE: NA127/E38/Box 30. Captured by Lt. Gray, 3 Feb. 1932, Biltigne River.) " ... ¶ Nuestro Ejercito no es caudillazco y está compuesto desde el mas humilde de sus soldados hasta su Jefe Supremo, todos son obreros y campesinos y sin prejuicios de clases, ni cientificos ni religiosos. ¶ Cuartel General del Ejercito Defensor de la Soberania Nacional de Nicaragua, Junio 20 de 1931. ¶ Patria y Libertad ¶ /s/ A. C. Sandino"
Adolfo Cockburn, Deputado Suplente. Memo from Gen. C. B. Matthews, Jefe Director GN, Managua, to Col. C. A. Wynn, Bluefields. "HEADQUARTERS GUARDIA NACIONAL DE NICARGUA ¶ MANAGUA NICARGUA ¶ 20 June, 1931. ¶ From: The Jefe Director. ¶ To: The Area Commander, Eastern Area, Guardia Nacional, Bluefields, Nicaragua. ¶ Subject: Adolfo Cockburn, Diputado Suplente. ¶ References: (a) Letter this office, OS—chk—4.0, 27 April, 131. ¶ (b) Your letter, 1 June 1931. ¶ 1. Reference (b) is acknowledged. The enclosures will be retained here for future use. ¶ 2. This headquarters agrees with the recommendation made in par. 4 of reference (b), but believes that the chances for its approval would be greatly enhanced if the Jefe Politico would submit a recommendation, together with substantiation evidence direct to the president. That procedure will, it is believed, be better than the alternative expressed in paragraph 2 of reference (a). ¶ OTTO SALZMAN, By direction." Petition from Miskito Indians. Memo from Gen. C. B. Matthews, Jefe Director GN, Managua, to Col. C. A. Wynn, Bluefields. "... 3. 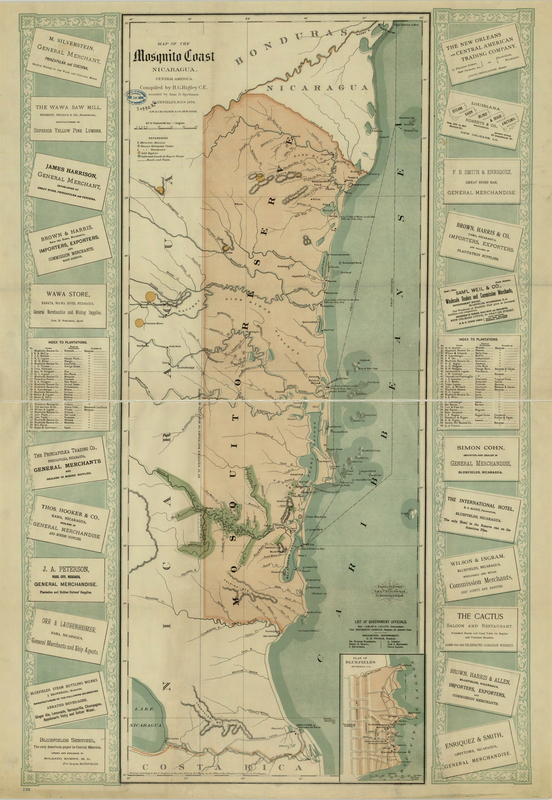 For the guidance of officers who may serve in the Eastern Area in the future and who may be confronted with similar matters, the Jefe Director desires it known that he considers the subject, dealt with in the Petition from the Miskito Indians, one beyond the functions and mission of the Guardia Nacional during its administration by officers of the regular United States service, and advises all concerned to refrain from discussing affairs which may tend to embarrass our connection with the Guardia. ¶ 4. It might be wise to remark that "to listen but say nothing" is safe, courteous, diplomatic and free from any complications." Letter from Gen. C. B. Matthews, Jefe Director GN, Managua, to US Minister Matthew Hanna, Managua, p. 1. "GUARDIA NACIONAL DE NICARAGUA, ¶ MANAGUA, Nicaragua ¶ 20 June 1931. ¶ My Dear Sir: ¶ In connection with copies of communications recently furnished to you on the subject of the proposed establishment of a guardia post at Waspook, Cabo Gracias a Dios, I have the honor to quote herewith, for your information, extracts from the letters received from Colonel C.A. Wynn, G.N., Area Commander of the Eastern Area, dated 3 June and 9 June, dealing with the matter now under discussion with Mr. Bordas of the Nicaraguan Products Company, Cabo Gracias: ¶ x x x In regard to the proposition of the Nicaraguan Products Company to maintain twenty men and the establishment of a post at Waspook, I have looked up the financial and business status of the Company and Mr. Bordas. The reports are not favorable. The company has very little standing and assets. The total amount of business done since the first of the year, according to the records in the office of the American Consul, is less than two thousand dollars. I have not been able to find out what properties they have in the vicinity of Waspook that needs such protection. Waspook is a most out of the way place and so far up the river as to be out of supporting distance or communication with any other guardia post. It will be impossible to maintain a thirty man post there without a large expenditure for transportation and rations. They could not be fed on a twenty cent ration. I presume that any contract with the company will place the burden of transportation and rations on the Company. I am very much in favor of a post at either Saklin or Kisalaya and believe that the interest of the company can be protected from one of those places. I have asked Inman for his recommendation and such information as he may have. x x x ( June 3) ¶ x x x The Nicaraguan Products Company is incorporated in New York. It is rumored that the presence of guardia at Waspook might be used in a stock selling scheme. As you know, the local [...]"
Letter from Gen. C. B. Matthews, Jefe Director GN, Managua, to US Minister Matthew Hanna, Managua, p. 2. "[...] manager is Mr. Bordas of Cape Gacias. ¶ They have a small saw mill at Cape Gacias which is the only holdings they have on the Wanks (Coco) River at the present time. ¶ They occasionally purchase logs from local holders on the River, but in the past six months their drafts have not been honored. This agrees with my previous report as (to) their financial status. Dunn & Co., in their business guide, reports the Company as not in good standing. ¶ From a strategical point of view, Waspook would be the ideal location. But its isolation makes it difficult to support and supply. It would be almost impossible during the rainy season. ¶ There are no housing facilities at either Waspook, Sacklin or Kisalaya for a detachment of thirty men. ¶ Should the plan go through to establish a post in this vicinity at the expense of the Nicaraguan Products Company, I strongly recommend that the Company be required to make a substantial deposit before the plan is put into effect. x x x (June 9) ¶ I am, My Dear Sir ¶ Very respectfully yours, ¶ C. B. MATTHEWS ¶ Major General, ¶ Guardia Nacional, ¶ Jefe Director. ¶ The American Minister,¶ Legation of the United States, ¶ Managua, Nicaragua." Radiogram from Sr. Manuel C. y Bordas, Cape Gracias, to Gen. C. B. Matthews, Jefe Director GN Managua, p. 1. "REFERENTE SU CARTA DE 30 DE MAYO SIENDO DE SUMA IMPORTANCIA EL QUE LA GUARDIA MANTENGA COMUNICACION INMEDIATA PUERTOS DE LA COSTA LA NICARAGUAN PRODUCTS CORPORATION OFRECE CONSTRUCCION ESTACION INALAMBRICO WASPOOK Y PAGARA MENSUALMENTE A LA GUARDIA CUATROCIENTOS CUARENTA CORDOBAS CORRESPONDIENTE SU CUOTA VIENTE HOMBRES ADEMAS OFRECEMOS LIBRE DE GASTOS EL USO DEL INALABRICO EL TRANSPORTE DE GUARDIAS SOBRE EL RIO DE ESTE PUERTO DE BAJADA COMO DE TREPADA PUNTO TAMBIEN DAREMOS LIBRE DE GASTOS CADA VEZ NECESARIO UNO DE NUESTROS REMOLCADORES Y CASA PARA EL ALOJAMIENTO GUARDIAS PUNTO EN CAMBIA PEDIMOS POR PARTE GOBIERNO LIBRE DE DERECHOS MAQUINARIAS CONSTRUCCION DEL INALABRICO Y EL COMBUSTIBLE NECESARIO SU MANTENIMIENTO PUNTO GASTOS TRASPORTE DESDE MANAGUA A ESTE PUERTO GUARDIAS PUNTO NUESTRO COMPROMISO ABARCA A DIEZ GUARDIAS ADICIONALES PUNTO ESPERO SU CONTESTACION MANUEL C. BORDAS"
Letter from Felipe Ubieta, Gobernador de la Comarca, to jefe de la Guardia Nacional Zona Norte de la Costa Atlantica Capitan Inman, Puerto Cabezas. "Por radio de ayer me permiti informarle vreveamente del regreso de la comision de la Guardia Nacional comandada por el Sargento Rivas, hoy por medio de la present hago mas extenso ese informe. ¶ La comision llego hasta Waspook requisitando los pueblos intermedios desde el Bon, no encontrando en ninguno de ellos señales ni noticias de insurjentes hasta en Waspook donde fue informado que Abraham Rivera mas de ocho dias antes habia estado en Sang Sang solo el con marinas: Que en Crautara hay unas mulas reconcentradas alli; y el vientidos en la noche llego la comision de regreso a Sacklin donde encontro al individuo Miguel Arana en comision de la Compañia en busca de trabajadores. ¶ Todos los vecinos de los pueblos que la comision visito quedaron muy satisfechos porque comprended que el Gobierno con la Guardia Nacional esta ampliando en este Litoral la zona de garantias para sus habitantes; meritorio seria el extender esta protecion con mas efectividad, lo que haria reeviver los negocios en este rio.-"
Patrol Report, 1st Sgt. Pablo Rivas, GN #174, Cape Gracias, to the Jefe de la Guardia Nacional, Puerto Cabezas, p. 1. "On 17 June 1931 I cleared in direction of the Rio Coco, and made a patrol through the villages in the vicinity of this port up to Waspook upon the river; on 21 June I arrived Waspook, all the villages were quiet inclusive Waspook. ¶ I only captured two national rifles which were found in hands of an unknown man, this was one of the bandits who fought in the R.R. line of this Port, when he saw the Guardia he ran out, but was shot and killed. ¶ The form of the patrol was well prepared: half of same went via the river and the other half via the trail, this under my command, in this form we arrived the mouth of the River at Waspook. I remained here one day gathering all possible information, and knew that around these places there are several mules belonging to the Company in Puerto Cabezas. All these places are quiet and I believe there is no danger for them if the Company wants to recover their mules. 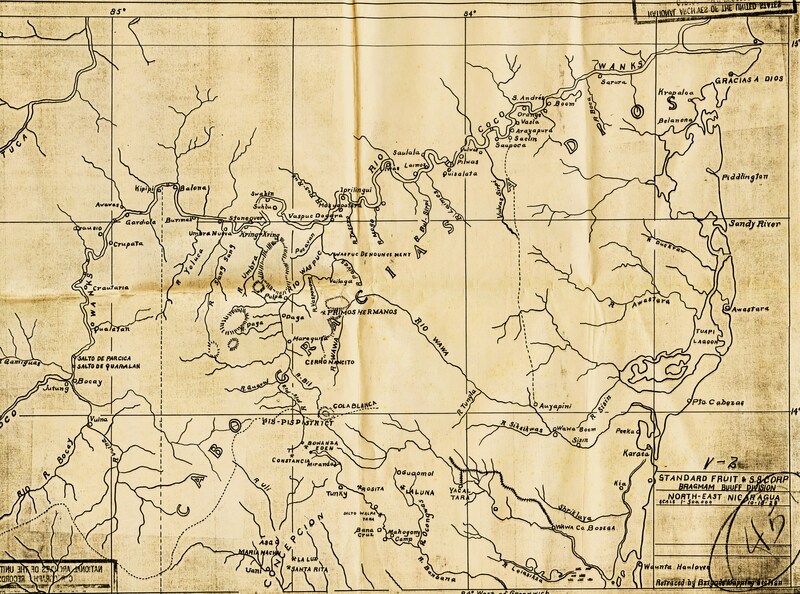 ¶ The mission of this patrol was specially for gathering information to verify the reports given by the natives living Rio Arriba, and I am sure that all the territory from this port up to Waspook is entirely quiet. ¶ All the members of this patrol showed a good conduct and discipline and all the gente (the people) on the river were entirely satisfied." Patrol Report, 1st Sgt. Pablo Rivas, GN #174, Cape Gracias, to the Jefe de la Guardia Nacional, Puerto Cabezas, p. 2. Capt. O. A. Inman, Dept. Commander, cover letter for Sgt. Rivas report, to Col. C. A. Wynn, Area Commander Bluefields. "1. As stated in reference (a) [Sgt. Rivas patrol report] and radio reports from Cape Gracias, 1st. Sgt. Rivas and seven Guardia cleared Cape Gracias at 2:00 PM. 17 June 31, with destination Waspoock. The patrol arrived at Waspoock 21 June 31., making a thorough reconnaissance enroute. The Patrol remained in vicinity of Waspoock one day, leaving by motor boat 22 June 31., and arriving Cabo Gracias 24 June 31. ¶ 2.- One prisoner, known by members of the patrol to have been with the bandits at Logtown 11 to 13 April 31., was captured and two rifles confiscated. The prisoner attempted to escape and was shot while running away."